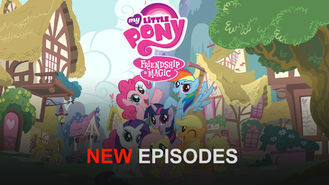 My Little Pony: Friendship Is Magic (2010) on Netflix Switzerland. Check worldwide Netflix availability! If My Little Pony: Friendship Is Magic isn't available in your country, or you are visiting a country where it isn't, there is still a way to watch it! Journey to the enchanted land of Equestria, where unicorn Twilight Sparkle and her pals have adventures and learn valuable lessons about friendship. Horse around with Twilight Sparkle and her pony pals in an enchanted land full of friendship and fun!